Only protecting from light, originally uploaded by rsepulveda. I've had this before, TWICE. Hence I know the symptoms by now. I'm having a bad viral eye infection. Nothing too serious if treated right. 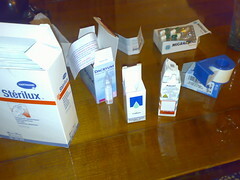 The symptoms: red eye + eye pain + crying eye + very strong sensitivity to light. 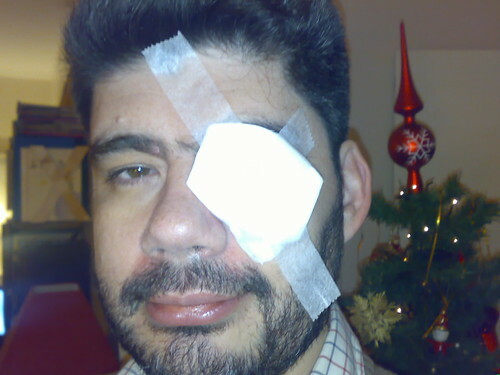 Hence although my eye patch looks serious, it's only to protect it from the light. 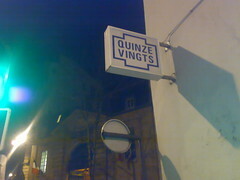 I've been prescribed tonight at the emergency unit of the Quinze-Vingt hospital (interesting story about this place...) a number of medications: hope it works, as my usual eye doctor does not work on weekends... A rather tough man, but excellent doctor. I'll check with him on Monday if I'm not better. Some day maybe, Google pages will be back at pages.google.com. Frédéric sent me an email a couple of days ago with a screenshot of del.icio.us being down… This offline category is getting fun! Now let’s be fair to them: there was an announcement online for the past few days, so well anticipated. 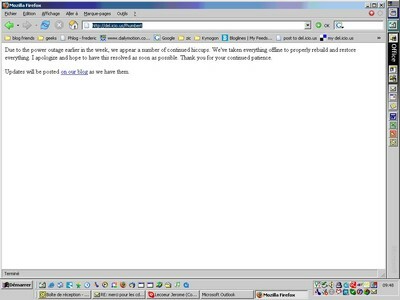 Fun anyways to keep adding offline pages on this site. I should create a category… done! it’s called offline. 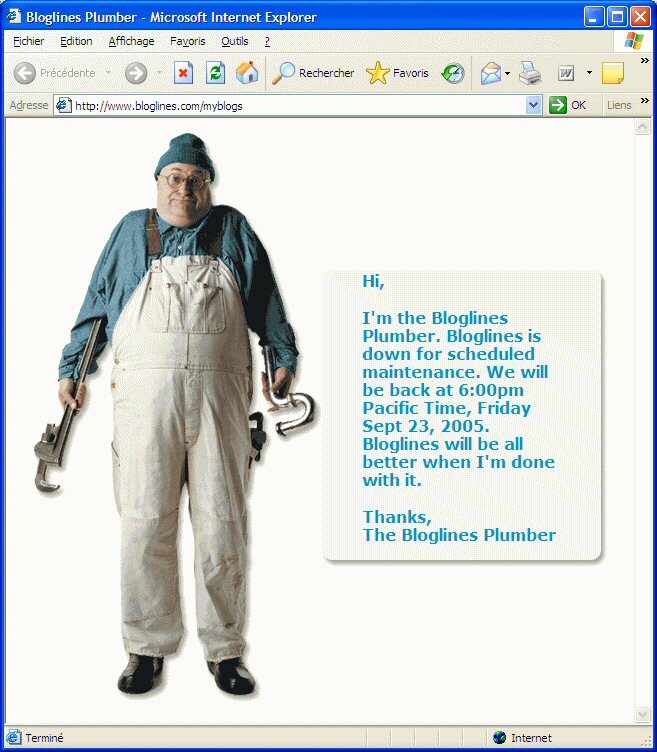 Not too long ago, I was telling you that my new speciality was spotting maintenance screens on the web ... Here we go again, with Apple’s store down a couple of minutes ago. I was just trying to check the status of my order for a video iPod and the new iMac. It’s been now SEVEN days, and I’m ready to start playing with them. On my way to check the status of my order, it seems I saw an updated G5 bi-pro ? Indeed it’s all up here. (maybe this is old news: I’ve just landed and am very very very late on my RSS feeds) Geez… If Apple starts shipping new products every other day, either we will buy them all, or buy none waiting for the next avatar… Wait. On apple.com, there are new powerbooks, and a new piece of software called Aperture. When will it stop !!! ? Now do we track all this: special events streamed live on the web every tuesday morning ? I’ll browse around later today and update this post. 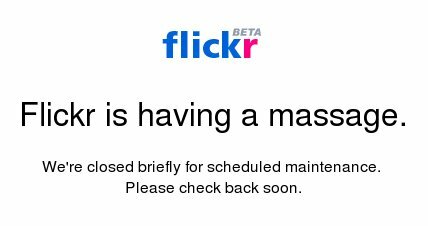 I don’t know why, but I keep stumbling on this maintenance pages (see here for Bloglines or Flickr for example). This is something that I do not understand. With the “do no evil” empire’s money behind it (=Google), or as a matter of fact with any well planned web site architecture, no site should ever be down right? Isn’t it a matter of having a proper web server architecture, with a completently redundant system: update partA while part B is up, then bring up the update partA, while part B gets updated (using load balancing systems like Alteon?)? Internet architecture experts, help me out here. (I’ve decreased the picture depth to make it faster to load). Cute ?